Fats are not your enemy! For too long, low fat diets have been leading the charge, people fear fat. We are told from a young age that’s it’s not good for us and we should avoid it. !… well, we grow up and the the cycle continues. Let’s break the cycle and turn our health around by going back to basics, back to real food, I’ll try helping you understand what to look for and why. Our number one enemy here are Trans Fats, these can also be labeled as hydrogenated or partially hydrogenated, stay away from these with a ten foot pole! Whilst some very small amounts of trans fats can be found naturally occurring in food, most trans fats in our diet are there from processed food. Trans fats were created in the 1950’s to help extend shelf life of products, add texture, increase stability and save costs. As the population began to grow the demand for convenience food was created. Basically Hydrogenation is the process of turning a liquid oil into a solid fat by adding hydrogen. It’s a complex process, the resulting molecular structure of the oil is nothing like it was to begin with. It’s now highly oxidised and allows lots of free radicals to take over and enter our system. There are many great books (The big fat surprise by Nina Teicholz, is an excellent, easy read) and articles that delve into the science of this, but I’m not a biochemist and will only give you the simple details. Trans fats are common in margarine, vegetable shortening, fried food, pre-made baked goods, and snack foods. Unfortunately you really need to start paying attention to labels! Omega 6 and Omega 3. These fatty acids are essential to our survival, our body can not produce them, hence why they are labeled “essential”, we must get them from our diet. Omega 3s are an integral part of cell membranes throughout our entire body. They also aid in building our hormones and regulating blood, heart and genetic function. Omega 6s are also necessary for our survival, but they’re not nearly as beneficial. Omega 6s help with muscle growth, hormone production and brain function. Our ideal goal is to eat just enough Omega 6s to function, but no more. We then balance out our ratio with Omega 3s. Our bodies can only store so much, and if you fill yourself up with all the Omega 6s, there will be no more room left for the Omega 3s to enter. Anthropological evidence suggests that human beings evolved eating somewhere around 1:1 while the ratio today is anywhere from 16:1 to 24:1. Mean while the Pre-industrial populations ranged from 4:1 to 1:4, many other cultures such as the Inuit and hunter gatherer’s who ate mostly meat, sit anywhere in between. It is believed that Omega 6s are pro inflammatory, while Omega 3s are anti-inflammatory. Some degree of inflammation is essential for our survival, however when the ratios are so out of proportion the inflammation becomes so chronic that it begins to become the primary driver behind a host of modern diseases, such as heart disease, metabolic syndrome, Alzheimers, arthritis, diabetes, autoimmune conditions and many types of cancer. This is quite possibly the most detrimental impact on society created by the Western Diet. So what type of fat should we choose? A key factor in making this decision is stability. This largely depends upon how many binding sites it has open. Fewer binding sites are more stable, therefore less likely to let a free radical oxidise them. Oxidised fats speed up ageing and create inflammation. All the binding sites are filled, hence the term ‘saturated’. ‘Mono’ meaning one, indicates there is one opening in the binding for a free radical to enter. These are reasonably stable, but not quite as much as saturated fats. ‘Poly’ meaning many, in Greek origins. And as the name indicates, there are several binding sites open and exposed to oxidation. This doesn’t necessarily mean we shouldn’t use these fats. In fact Omega 6s and Omega 3s are both Polyunsaturated fats, we just need to choose ones which have the lowest levels of Omega 6s. Have I lost you or are you still with me?! 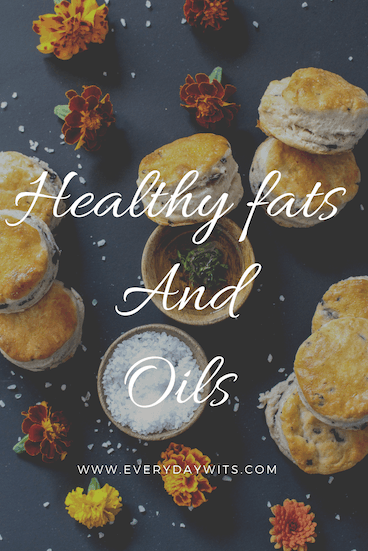 It’s a lot to take in… but now that we have covered what fats are and their roll in our body we need to consider which ones we should choose to cook with. When cooking at high heat, many oils, regardless if they’re “healthy” can oxidise and become rancid, this means they are creating free radicals and will lead to inflammation. As a general rule of thumb, the more “saturated” a fat is, the more stable it is under high temperatures. This goes back to our “bonds”, the less breaks there are in the fatty acid molecule, the less likelihood of oxidation or rancidification occurring. So Saturated fat and Monounsaturated fats are a better option than Polyunsaturated fats because of their molecule structure being stronger and less susceptible to free radicals. Coconut oil, is our best choice for very high temperatures, not only is it shelf stable for months, even years, it also contains high levels of Lauric Acid, which can improve cholesterol and help kill bacteria and other pathogens. It also plays a roll in slightly increasing your metabolism. Lard/Tallow, a rendered down animal fat, can be another excellent choice, but you need to be aware that if it’s been grain fed the composition will become much higher in polyunsaturated fats. Keep your eye out for grass fed, pasture raised products which will be higher in monounsaturated fats. Butter, a great alternative to lard if cooking at a lower heat, due to the lactose content, it does tend to burn faster. You could make it into Ghee, or just buy ready made Ghee. Butter is high in Vitamin K2, A and E, with many other great health benefits, it really is a great option. As with lard and tallow, look for pasture raised/grass fed. Olive oil, well known in the mediterranean diet, a diet which consistently gets referred to for its ‘heart healthy’ benefits and longevity its people. Olive oil is predominately monounsaturated, however, still fairly resistant to high temp cooking. Make sure you choose a good quality Extra Virgin Olive oil and not a blend. When purchasing, make sure it’s in a dark container. If kept in a cool, dry, dark place with limited exposure to oxygen, it should prevent rancidity from occurring. Macadamia oil and Avocado oil, are also high monounsaturated fats, but they are very pricey and I’m not sure you’d waste your money to cook with these oils anyway. They’d be a great edition to home made mayonnaise or salad dressings. Canola oil I have to put this one here because its Omega ratio is actually perfect 2:1. However, Canola oil must go through a very harsh processing method utilising toxic solvents and many chemicals which are undoubtably unsuitable for human consumption. Here’s a link to check out the production methods of canola oil (and many other highly processed oils). There are many nut and seed oils out there, many however are predominately polyunsaturated, and should not be cooked with, the only exception is macadamia oil, which is more likened to olive oil in composition. The following list of IndustrialSeed and Vegetable oilsare highly processed, refined products, which are way too high in Omega 6s and should be avoided all together. Many will also contain Trans Fats. Healthy Tips: Replace all your Industrial oils with healthier variants. Butter instead of margarine, Olive oil instead of canola, and use Saturated fats for high temperature cooking. Switching oils and reading labels to make sure you aren’t getting something you shouldn’t will make a remarkable improvement in your health. Decreasing inflammation is the number one step to preventing modern day disease and health conditions prevalent in todays society.